Asian flavors are in my top five favorite; sensual, balanced, clean and simple. I’ve never trained in Asian cookery, although I’ve devored cookbooks, dined in high and low establishments and even stalked a few chefs, all in the name of research. Ginger and soy, scallion and chile all make my way into dishes, which are only authentic by honest desire. I can only hope that my American asthetic can properly respect the ancient dishes they are fashioned after. This dish is a riff on a recipe I found in Food and Wine, and it can be endlessly changed with the seasons of the farm box. 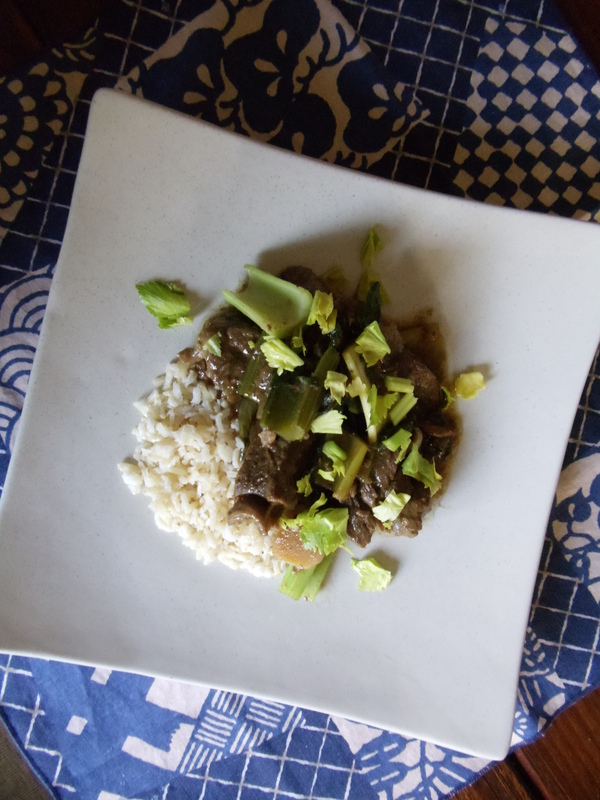 The key is to cook the base of the stew and let it hang out in the refrigerator for a night or two, then braise the vegetables (Napa cabbage, carrots, radish, or like I used, bok choy and celery) separately, or even pop some pickled summer vegetables on top. In an 8-quart Dutch oven, heat the oil. Season the meat with salt and pepper and sear the pieces over moderately high heat until richly browned all over, working in batches. Remove the meat from the Dutch oven and pour out most of the fat, leaving only a tablespoon in the pot. Add the onion, garlic, jalapenos and ginger, and sauté until the vegetables soften. Add the soy sauce, sugar, wine and stock and stir. Bring the liquid to a boil and add the meat back into the pot. Reduce to a simmer and place the lid on the Dutch oven. Cook for 2 hours, until the meat is very tender and pulls apart with a fork. Cool and place in the refrigerator for 24 hours. Remove the meat from the refrigerator and skim the chilled fat off of the top. Heat over low heat until warmed through. In a large skillet, heat enough vegetable oil to coat the bottom of the pan, then add the celery and bok choy. Sear the vegetables very quickly, about 2 minutes, until they are a vibrant green, then pour a dash of soy sauce over them. Cook until the soy sauce has coated the vegetables, and then add them into the beef stew. Put the cornstarch in a bowl and whisk in a 1/2 cup of cooking liquid, then whisk it into the stew, cover and let simmer for 2 minutes. I don’t understand what you mean by cored baby bok choy. Can you explain? Hi Barbara! Cut the bok choy in half, then at the bottom you will see the core that holds it together. Cut that out and throw away before you slice up the bok choy.